Jonny Bairstow and David Warner smashed sensational centuries to guide Sunrisers Hyderabad to a comprehensive 118-run win over struggling Royal Challengers Bangalore in an Indian Premier League match here Sunday. 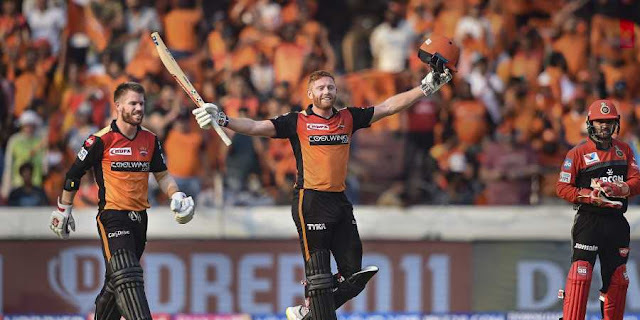 Englishman Bairstow struck 114 from just 56 balls while Warner carried his bat for a 55-ball 100 in a record 185-run first-wicket partnership to post a mammoth 231 for two after being put into bat. With a gigantic target to eclipse, RCB needed a rollicking start but the visitors' chase never got going as they kept on losing wickets to be bundled out for 113 in 19.5 overs.